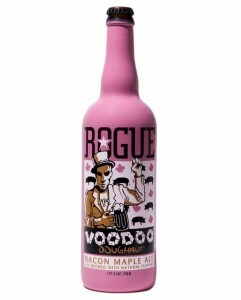 There are very few I would trust to make a drinkable bacon beer. The beer nuts over at Rouge Ales are among of those few. 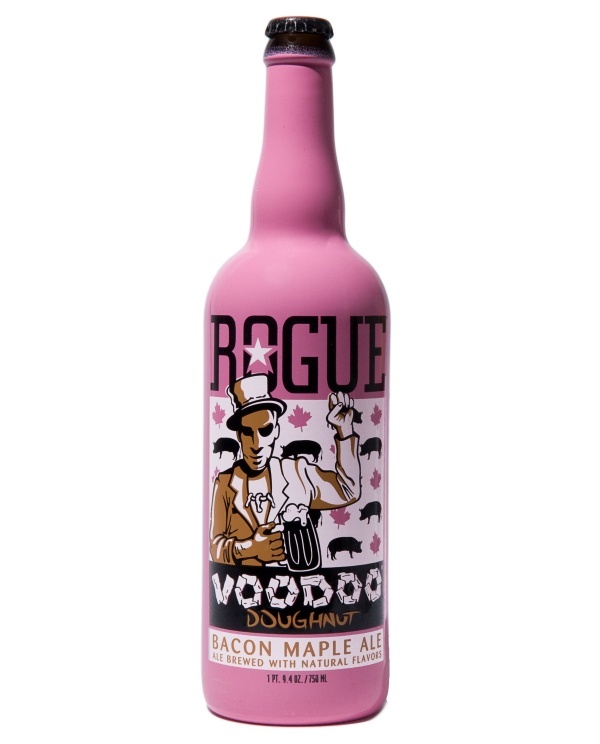 Much like Dogfish Head, Rouge Ales is willing nurture and execute insane beer ideas. While the mad scientist concoctions may not fit my everyday drinking style (or budget), I’m constantly impressed by the expanded conceptions of beer. The Bacon Maple Ale–ingredients including Briess Cherrywood Smoked Malt, Weyermann Beechwood Smoked Malt, House-smoked Hickory Malt, and Applewood-Smoked Bacon–was no exception. Smell: Maple and a lot of smoke. Like opening a pack of quality thick-cut smoked bacon. Taste: My first thought actually wasn’t bacon, but breakfast sausage drizzled in maple syrup. As I tasted and smelled the bacon flavor grew into a sweet and savory combo. However, as the beer warmed, a sharp bitter finish began to develop. Mouth: Medium carbonation. A little creamy. Overall: This beer is a ton of fun. Though the bitter finish rains on the parade a bit. I can’t see myself drinking this often, but feel it would make a great morning beer with a plate of eggs. Yesterday evening, with my TPS reports completed (correct covers and all), I left the office at a reasonable hour with embryonic cooking ideas in my head. As I got to the store, I still had no solid idea of the menu. But I had time to wander the aisles and ponder fish vs poultry, grilling vs the oven, salad vs pasta… In the end I decide to make-up a new chicken recipe. Union Market has a hot pepper jelly that has been taunting me for months. As my mind settled on roasting a chicken, I knew I had to make use of this jelly. But what else… then the universal truth came to me: bacon makes everything better (and perhaps thinking back to Meg’s butterfly chicken). And Union Market just happens to have some pretty fine looking bacon. Some carrots, celery, onions, and potatoes fell into my basket for side dishes. Finally, I grabbed a thing of cilantro to top everything off. Now this dish takes a bit of time, but almost all of that is passively letting everything cook. You need about 20 minutes of prep. I put the chicken in a dutch over, peeled and chopped the veggies and put them in along with the potatoes. 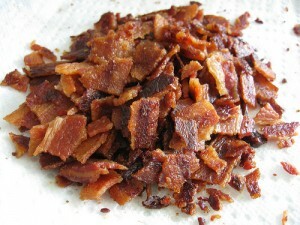 Next I took my pound of bacon, gave it a fine chop, and mixed it in a bowl with maybe a half cup of the hot pepper jam. About a third of the bacon pepper jam went into the bird’s cavity, about third under the skin, and about a third on the top-side skin. 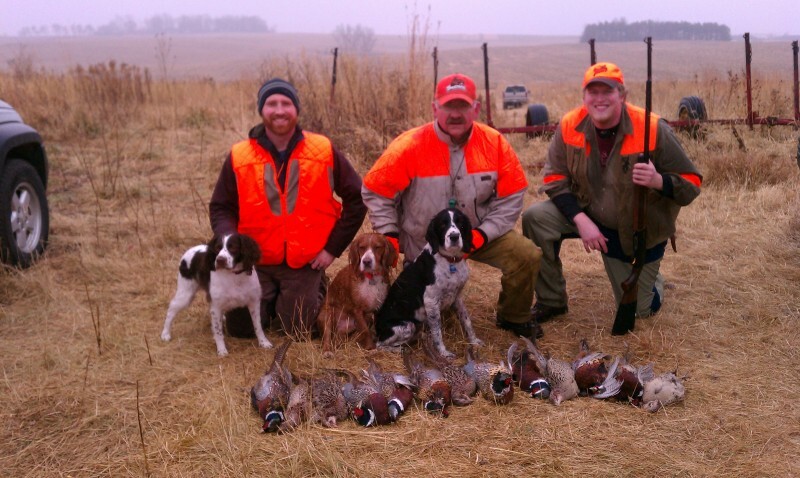 For good measure, any extra little bacon pieces on the cutting board were put on the potatoes. 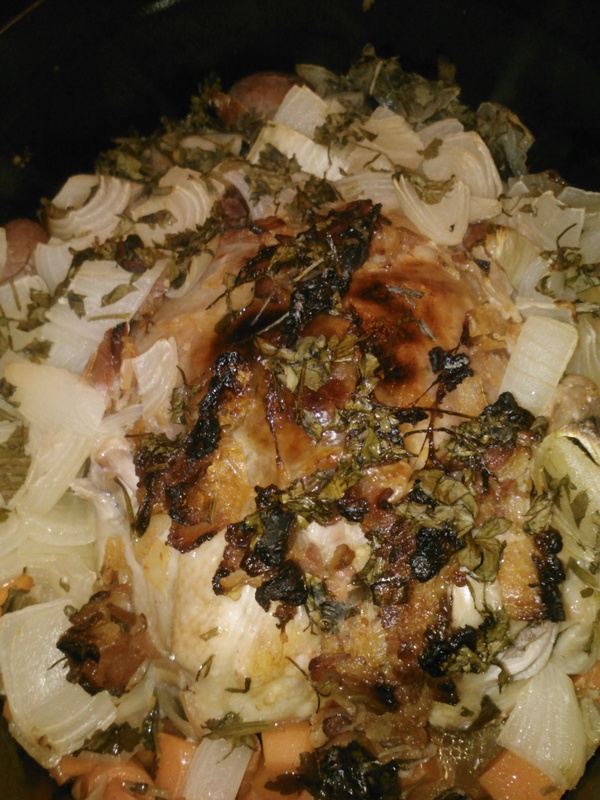 With the lid on, and the oven at 375, I just let everything cook for maybe a bit more than 90 minutes–after about 30 the smells of onions, chicken, and bacon were wafting through the apartment. I took the lid of for the last 15 or so minutes, as I made some quinoa, just to help the onions brown a bit; because of the sugars in the jelly, the chicken was already there. And how did this improvised concoction turn out? Well, between Nick, Fayaz, and I, we took down almost the whole bird and all the veggies. There was a little sweet and heat from pepper jelly and bacon added all the savory you could hope for. I realized, after it was in the oven, that I had forgotten to add garlic. But, I think this error might have been for the best. [You can pick your jaw up off the floor.] There was plenty of flavor that worked well together. I feel that the garlic might have just gotten in the way. If I were going to add something else, it would be more heat, probably by adding diced hot pepper to the bacon jelly mix. More than just the food, it was nice to sit down at a table mid-week with my roommates and chat–much better than the usual take-out in front of the TV with the work laptop going. The long furlough is over and we are back at it. Our apologies for the delay, Arthur was studying for the Bar Exam and I was in the middle of changing jobs and apartments. Now that these things are out of the way, we’re hoping that we can once again get into a regular rhythm of new recipes and restaurant reviews. I’m happy to say that my new residence is far more conducive to culinary advenutures and the documentation thereof. The kitchen is much bigger, the stove /oven is much better and I also moved in the with my buddy Tyler, whom our readers may remember from the Lasagna Files. I’m sure some of Tyler’s own cooking experiments will be featured at some point, as he has some nifty recipes of his own like soy-pickled jalapenos, pickled northern pike, creamed cucumbers and other things. Those serial killer eyes hide some culinary inspiration. Get your hands in there and make some burgers! Maybe a little something else. I threw in a bit of minced oregano and rosemary, mainly because we have a huge herb garden outside the back door. Chili pepper flakes would not be a bad idea either. 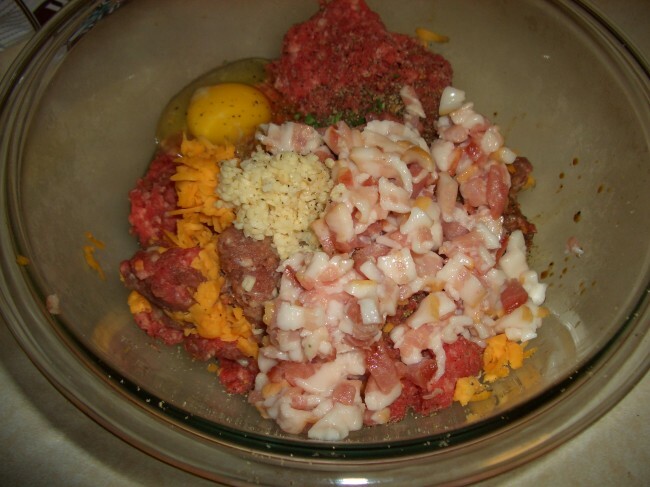 Mix all of that together with your hands, then separate and form the patties. We got 5 burgers out of the batch, and they seemed to be a good size. Throw them on the grill for a few minutes per side. 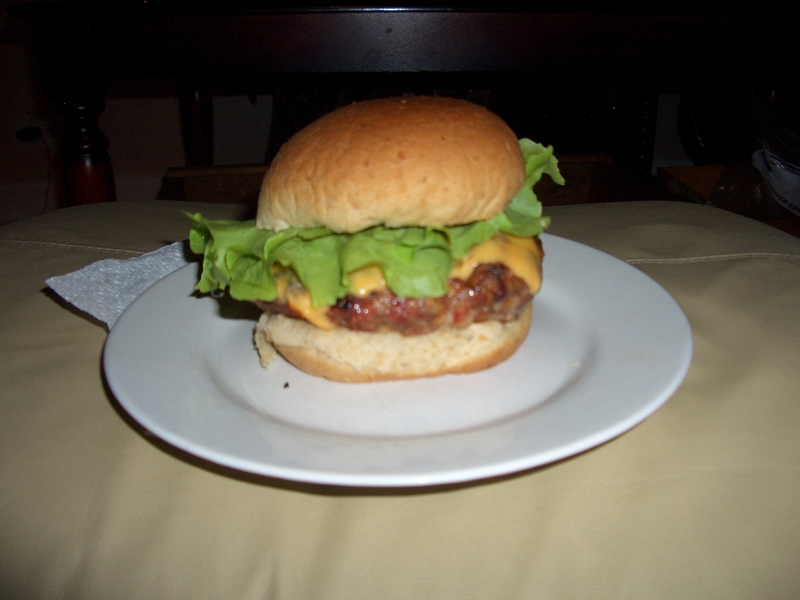 Because these burgers have raw pork in them I cooked them a little more than the medium/medium-rare I usually prefer. By the time I took them off the grill there was almost no pink in them, but because of the bacon the burgers were still incredibly juicy. Add the (fake) cheese slices about a minute before you take the burgers off the grill, then let them rest post-grilling for a few minutes before eating. Top your burger with whatever you normally prefer. Unless that happens to be mayo; don’t do that to any burger. P.S. FOOTBALL SEASON IS RIGHT AROUND THE GODDAMN CORNER! Its a cruel irony how much football makes me look forward to the end of the summer. Especially when this pantload is no longer whiffing blocks all game long. Anyways, we’ll have some more great appetizers and grazing food here on ECL once the season officially starts, including beer-cheese dip and fresh spring rolls with jalapeno syrup dipping sauce! I was introduced to this bacon at a young age. 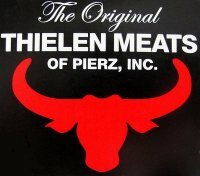 It comes from a small town around Lake Mille Lacs in northern Minnesota, called Pierz. This bacon is amazing. Inspiring. Life-affirming. You must try it. Don’t believe me? Go check out this write-up in the New York Times. Everything she writes is true, it is the perfect balance of thick and thin, meat and fat, smoky and delicate flavor. My dad and I made a point to make the 40 minute trip once a month to make sure the freezer was always stocked with this manna from heaven. Now the Lund’s in Uptown carries it, although I don’t know how far their distribution has spread outside Minneapolis. Either way, order yourself a pound or ten (they will ship it from the website, I’m pretty sure). Brown the bacon in the pot (remember, it has to be big enough to hold all them mussels), then remove it to a plate. Add the sliced shallots and minced garlic to the pan. When the shallots are translucent and before they really brown, add the wine to deglaze the pan, stirring to incorporate the brown bits from the bottom of the pan. Add the tomatoes and juice form the can and let everything simmer on medium-low for about 10 minutes. 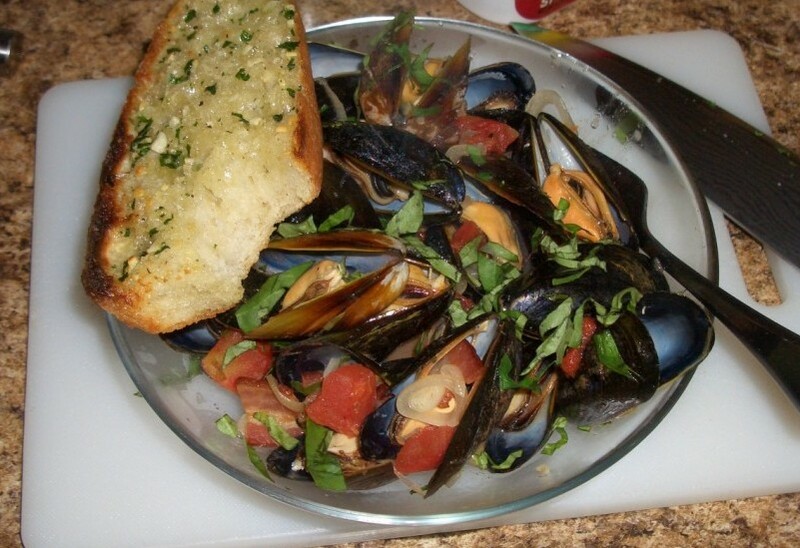 Now it’s time to add the mussels. Standard disclaimer when working with bivalves: look for any ones which are open. Tap them or squeeze them a few times; if they don’t close on their own, toss ’em. Add the rest to the pot, shake them around and stick the cover on. Put on the lid and let them steam for about 6 minutes, then check for doneness. Step one is are they all open. If yes, give one a try to see if it’s done correctly. They might need another few minutes, but probably not much more than that. Add in the tablespoon of butter, and chiffonade the basil then stir that in as well. 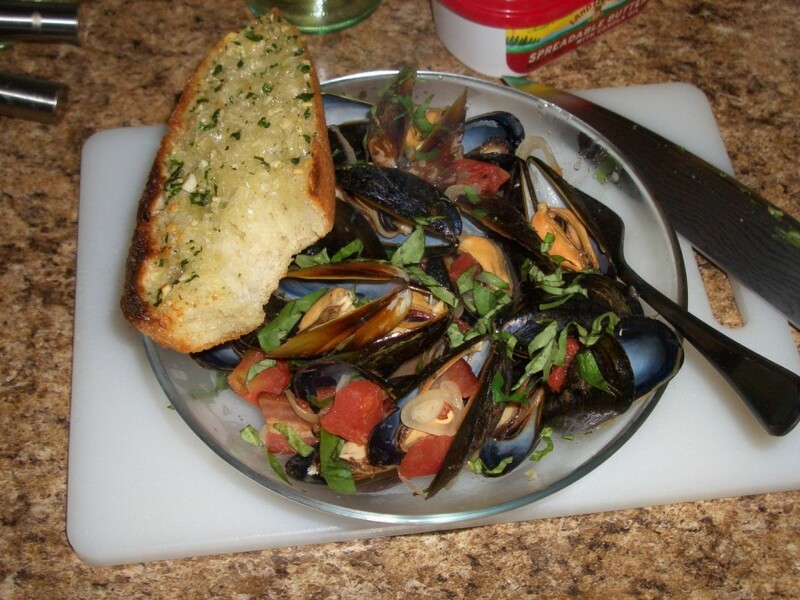 Remember to get a good amount of that wonderful sauce in the bowls with the mussels, and serve some nice crusty bread with dinner to sop it up with. Enjoy! This week’s football food is an adaptation of a recipe from one of my favorite food blogs (besides this one), The Food in my Beard. There have been some really cool recipes over there, some of them far more ambitious than I am prepared for. He also seems to have a knack for coming up with dips, which are of course perfect football food. 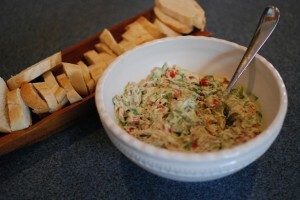 At one point I stumbled on his BLT Dip and it looked amazing so I gave it a whirl (check out the link, the pictures are what really inspired me to try it). Overall it was pretty good, with some awesome flavor combinations. There was only one problem: the mayo. I don’t know about you readers out there, but I am NOT a mayo fan. It’s one of those condiments I barely tolerate, sort of like sauerkraut or Dijon mustard. A little bit will usually help your cause, but a there is a very fine line between a little and way too damn much. And once you cross that line, you’re screwed. There is no going back so you might as well just throw whatever you were making in the trash, go brush your teeth and start over again. In this case, it was not immediately obvious that this was a problem. I made a big batch of the dip for a game and everyone dug in. But after a few minutes all I could think of was the mayo flavor and mayo texture and it was just wrong. I ended up throwing a big tub of the dip out because there was just no way I was going to eat any more. This is certainly not a shot at the culinary skills of the recipe’s creator, just a personal taste thing. Anyways, I modified the recipe slightly to avoid a repeat of the over-mayo trauma I experienced. The recipe’s name? PTSDBLT Dip. It strays even farther away from religious adherence to the ingredients of a BLT, but its damn tasty in its own right. For the base of the dip, skin and pit two ripe avocados and drop them into a blender along with 1/3 cup of sour cream and 1/3 cup of mayo and the juice of half a lemon. Blend that until smooth and add to your serving dish. Add to that a carton of cherry tomatoes which you quartered, about 1 Tbsp of minced shallot, and half a pound of torn arugula leaves. I love arugula; it’s so peppery and unique for a green leafy vegetable. And this is a great recipe for it because you need something that will have a flavor capable of standing up to the creamy avocado/mayo/sourcream mixture. The last thing to add is by far the most important: BACON. If I were you, I’d try to find something nice and thick cut. No Name makes pretty good bacon, and if all else fails most any butcher should have some top notch stuff. Cook up about ¾ of a pound of it, and just like for the Jalapeno Poppers, you want to cook it to fairly well done so that almost all of the fat is rendered out. Crumble that up and add it the bowl, then fold everything together. Finally, give it a taste and then add salt and pepper to your liking. By the way, this one definitely goes with sliced bread. It’s just too chunky and thick to pair well with chips, and with all that bacon the dip is plenty salty without adding potato or corn chips. We got Randy. What the hell is going on here? Imagine that you’re back in 2004 and someone says to you “Don’t worry about trading him to Oakland. 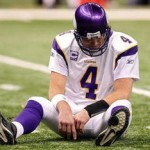 He’ll be back in 6 years and, oh yeah, Brett Favre will be tossing him passes.” WHAT?! Your head might have exploded then and there. 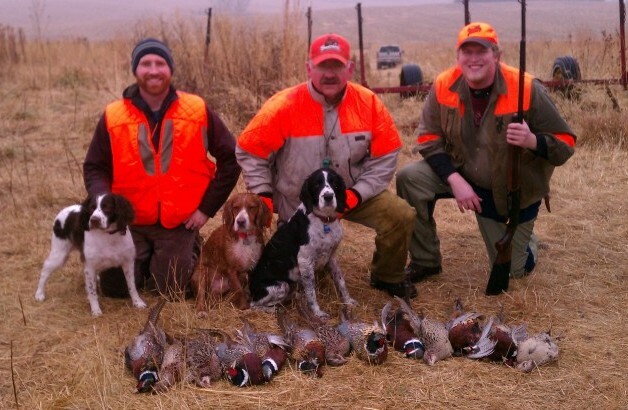 Allow me to use this opportunity to publicly declare my love for Zygi Wilf. This man is a god send and 90% of NFL fans wish they had an owner like him. My only concern here is that the ownership is going to shell out for player after player to try to win now, and then we falter in the playoffs and the stadium bill goes down in the legislature. That’s when I see good ol’ Zygi throwing his hands up and deciding to cut his losses. As for this week, I’m afraid I don’t see good things; and that’s only partly because I refuse to be the homer who picks the Vikings every single game. I think jumping to a new team, combined with facing Darrelle Revis is going to mostly shut down #84. There are three other main things going for Jets next Monday: 1) The Brett Favre incarnation of the Vikings has been absolutely terrible on national television, with the sole exception being the annihilation of the Cowboys in last year’s playoffs. 2) I think coaching does matter in the NFL and if I had to rank these two coaches I would say Ryan is top-five in the NFL and Chilly is bottom-five. That’s not a good matchup. 3) The Jets are a bunch of blitz-happy motherfuckers. 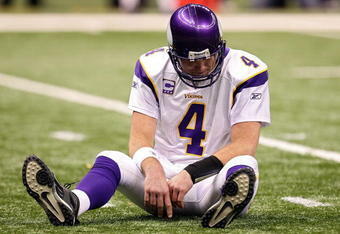 They are going to put a hurt on old man Favre, and send extra defenders from all over the field. Final score: Jets 20, Vikings 17. 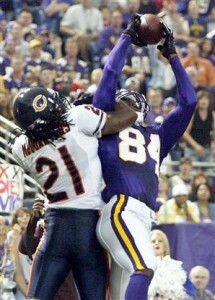 Arthur’s Two Cents: Having Moss back in MN is going to be a game changer. And for third round draft pick?!?! Until the offensive line learns how to give Farve more than a blink of time in the pocket here is how see things. Moss won’t be used for his very deep threat potential, but for more modest passes. 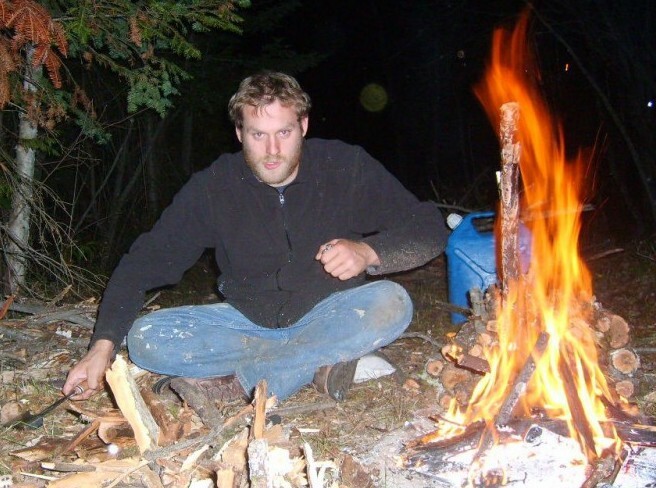 Farve will be able to trust him and have just enough time to find him quickly. With AP on the field and Farve’s ability to find the some other recivers he won’t be triple covered like he was in his last year with the Vikes! On the game versus the Jets, I don’t know if we can pull it off, but I think that we have a real chance. Revis got hurt covering Moss, maybe that will get in his head a little. 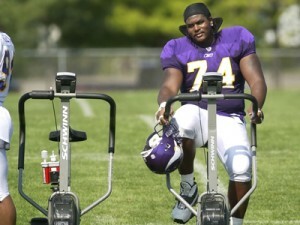 I see the Vikes at 21 and the the Jets at… well we’ll see what our defense can do. On the food: this sounds like a great dip. Meg is planning on making up some bread this weekend. But, since this is a Monday game that I’ll actually be able to watch at home, I was thinking of breaking out the old deep fry and getting some homemade wings going. Though this might be great for Thursday poker night. My other thought is that that the high mayo version might work great not as a dip, but to use instead of boring plain mayo on burgers for grilling time. Well that last game sucked huh? If you would have told me that the Vikes would hold New Orleans to 14 points and have only one turnover, and STILL lose, there’s no way I would have believed it. Oh well, at least my fantasy team seems to be doing well. Hopefully I won’t have to console myself this way all season long. I hope you liked the buffalo chicken dip from last week. This week’s offering will be even more tasty, if for no other reason than it contains BACON! I absolutely love these little buggers, and every time I have made them they received rave reviews and inspired prolonged nagging that I should make them again. I like to make these when I’m going to a party or someone else’s place because you can make them completely beforehand and then just throw them in the oven when you get somewhere…. And also because I would eat the whole batch by myself if someone else wasn’t around. 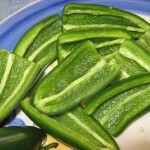 Slice the jalapenos in half lengthwise and use a spoon to scrape out the seeds and ribs. Set these aside and make the filling. First off, cook those bacon slices on medium heat until they are pretty well done. 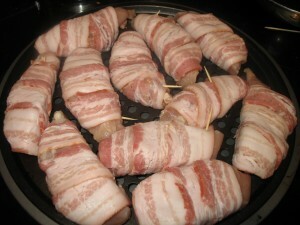 You want all the fat rendered out, and good amount of browning on the bacon. Remove from the pan, chop them up and then throw that in whatever mixing bowl you are using for the cheesy goodness. Then mince the garlic cloves. Turn it into garlic paste by adding a pinch of kosher salt to the garlic and then grinding it into the cutting board. Some people use their knife for this; I prefer the back of a spoon. Pasting the garlic will bring out the juices to mix with the cheese, and make it more homogenous so people don’t get chunks of raw garlic in their mouth. 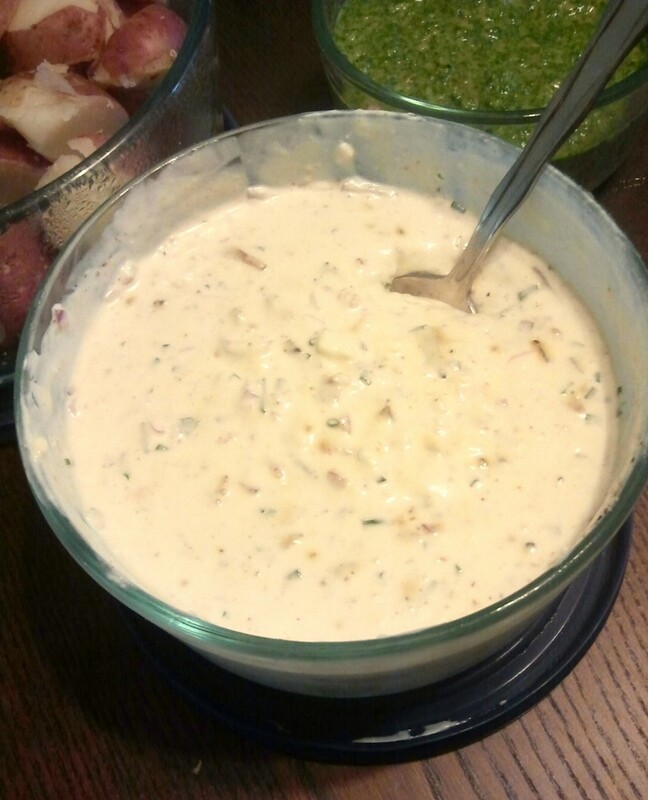 Add the garlic to the bowl, along with the minced herbs (if you like), a few grinds of black pepper, and the cheeses. Mix well to combine and – if you have the time- cover it and refrigerate for an hour or two. We all need more bacon in our lives. Then pile the filling into the jalapeno shells. If you’re looking for an exact amount to put in each jalapeno, you are a deranged and misguided person. Just eye it; it’ll be good for you. Put the poppers on a baking sheet and put them in an oven you’ve preheated to 350. Let them bake for 10 minutes, then transfer the sheet to beneath a broiler and finish them off for 2 or 3 minutes, until they look a little golden. DON’T START DOING SOMETHING ELSE WHILE THESE ARE BROILING!!! These things are small, and you will burn the whole batch before you get half way done with whatever it was you were going to do. Note: If you have leftover cheesy-goodness, it makes a fantastic spread for a baguette or crackers. Try it sometime, and you just might forget about the jalapenos in the future. I’m not entirely sure what to expect for this game, mainly because I think it might take Favre until after the bye week to truly be on the same page with all of his receivers. Here’s what I do know: AP is looking good. Last season we saw way more of those runs for no gun, or +/- 1 yard. Last week it looked like AP in year 1, where you knew every time he touched the ball was good for at least 4-6 yards. Throw in a few busted tackles and he can easily rack up 150+ yards in almost any game. I like what I see from him and this week I expect the Vikings to make a concerted effort to stick with the gameplan of feeding #28 the rock ALL DAY long. We can’t look past Miami as much as we once could, they are definitely on the rise, but I like how we match up here. Our front seven has gotten, if possible, even better since last year and I cannot see the Fins running their way to victory in this game. I also don’t think Chad Henne has what it takes to win the game through the air when that becomes necessary. Vikes win in a low scoring rushing game, 21-17. Arthur’s Two Cents: Looking back at last weekend I think that half the problem with Favre’s game was the offensive line. Yes, he isn’t completely in tune with receivers. BUT this man can throw the ball to anyone if he has the time. I think that versus Miami he’ll have at least a few more seconds in the pocket, which will give him time to look down field and come-up with some big plays. Versus the Saints Favre didn’t seem to go for many long passes (only handful of attempts beyond 5 or maybe 10 yards). I’m not sure if this was his own caution or if it was Brad Childress’ play calling. Either way I think that against a team that is, still a threat, but not the defending Super Bowl champs, we’ll see at least a little of Favre from last year.